Tempeh is one of the ingredients that I always have on hand, as a substitute for meat dish sometimes, this recipe is also good for people who do not eat meat / vegetarian or vegan. Very easy to cook and does not require much time. can be mixed with a variety of vegetables that you like and served with rice. fry onion, garlic and grated ginger for about 2 minutes, add tempeh and fry until lightly brown,add vegetables, stir and add the rest of spices ingredients and cook for another 5 minutes or so, ready to serve, served with rice is best. 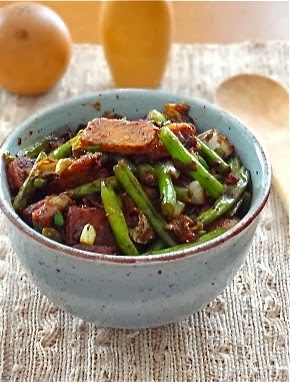 Haven't had any tempeh in a long while...the stir-fry looks very tasty! A combo of Chinese and Indian ingredients for the spicy and yummy flavors. Btw, tempeh is one I can't resist. Such a tempting vegan dish! Lovely!